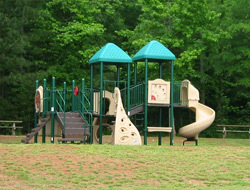 This smaller day use park is located off of Sweetwater Creek Drive in Canton, GA. The park and campground are both located off of the same spur road. The main attraction at Sweetwater Park is its swimming beach. There is also a nice group picnic pavilion that has a volleyball court and two horseshoe courts adjacent to its seating area. There is a $4 fee to enter and use the park's facilities. A building with bathrooms is located off of the parking area that is furthest from the beach. Sweetwater Day use park is open daily from 8 AM to 8 PM. Swimming Beach - There is a roped off swimming area that is located off of a shoreline sand beach. The back of the beach has a children's playscape and there are also numerous picnic tables found in this area. No glass containers and no pets are allowed on the beach. Picnic Facilities - There are a few individual picnic tables near the swimming beach, with each also having a family sized barbeque grille nearby. 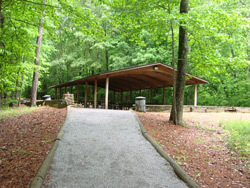 The large group picnic facility has a large covered pavilion and two large grilles ($175 fee). 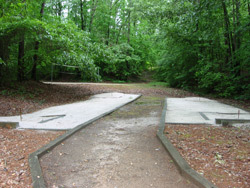 A volleyball court, complete with a net, and two horseshoe courts are found adjacent to the group picnic area. A smaller pavilion can be reserved for $75 and is suitable for up to 50 people. Call 678-721-6700 for reservations. 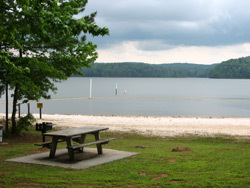 The swimming beach (just prior to an afternoon thunderstorm) and the playscape at Sweetwater Day Use Park. A view of the foreshore courts and, in the far left background, volleyball court that are adjacent to the group picnic facility. The photo on the right is the group picnic pavilion. There are two large barbeque grilles and numerous picnic tables under the open sided roof.